It’s been two months since the 7.0 magnitude earthquake that rattled Southcentral Alaska, but residents are still grappling with damage. Including some that’s only now coming to light. The Valhalla Center, a strip-mall in midtown Anchorage, houses popular Korean and Indian restaurants, as well as an Asian grocery store and several other businesses. It is fully shut down while safety repairs are made to the main structure. Noffsinger serves as a building official for the municipality, and said the earthquake damaged wood that was already wracked with severe rot and exacerbated other structural deficiencies in the Valhalla building. But some of the businesses there remained open until last week, when city investigators decided the damage posed a safety risk. Once the wooden trellis is removed, some tenants may be able to reopen. But the east and west ends of the building, where the walls pulled away from the roof, could require more involved repairs. There are still many properties across the city that public officials are evaluating for damage. “We’ve done around 1,600 damage assessment requests throughout the entire municipality of Anchorage, and we probably have at least another 1,200 yet to get to,” Noffsinger said. Those, he added, are just buildings where inspections have been requested. There are likely more cases where officials have not been contacted. 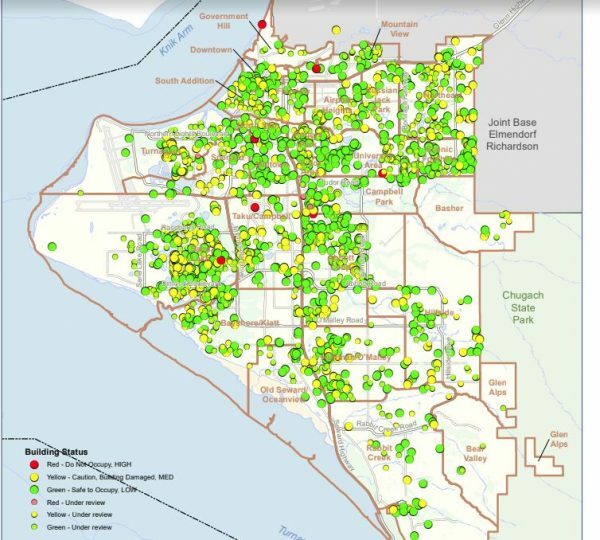 According Chris Schutte, director of the city’s Office of Economic and Community Development, as of Wednesday January 30th, 76 homes remain too damaged for safe occupancy, the majority of them in communities around Eagle River. Around 2,900 other properties are noted as having a degree of damage, but are habitable.